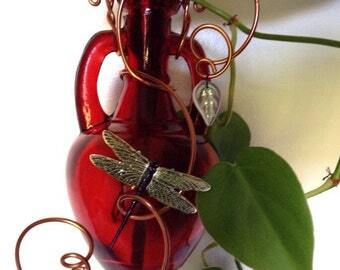 I have created this dragonfly vase using a stamped brass charm that I hand color and lightly glitter. 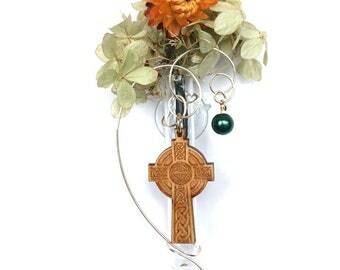 this home decor item can be used as a hanging glass rooting vase and as an essential oil diffuser. Place a few fresh flower buds into the vase and present as a gift for a gardener. The perfect bug lover gift for any occasion. With its own suction cup permanently attached, this works well as a memorial vase to place on a funerary or glass enclosure for cremains. 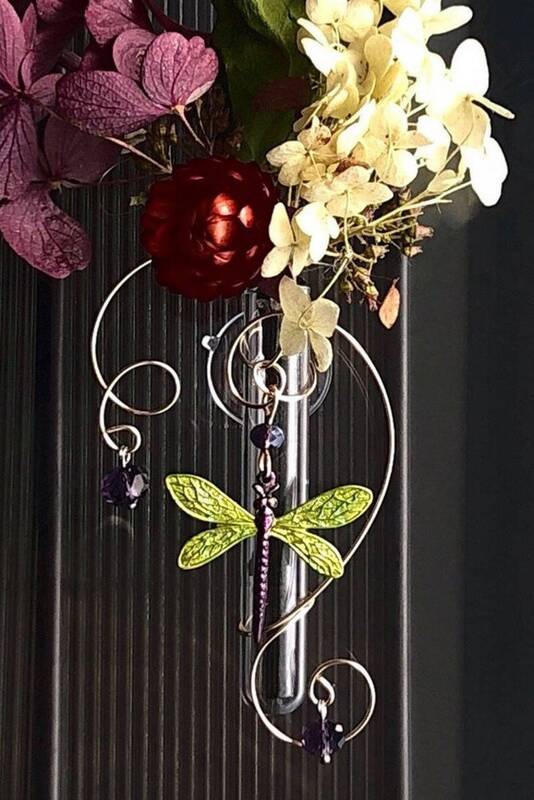 This window vase is wrapped in wire with choice of color left to you. I will match with appropriate beads. 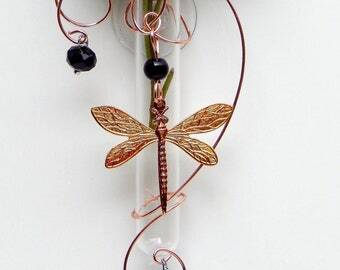 The dragonfly has been around since, well practically since it all began! This insect gift will appeal to any nature lover. Vase is 3 inch size and can hold a lot. Before you hang this suction window glass bud vase be sure that the mirror or glass is clean and then apply a very slight film of oil onto the suction cup to seal the suction and hold it up. The oil works like water but is better because it does not evaporate. Vaseline, baby oil or cooking oil works just fine to use this as a suction window bud vase. I take great pride in my work and my customer service. If there is any problem please contact me and I will work to make it right. I realize the fragility and risks of using glass for the vases but the plastic tubes get dirty and cloudy and become very difficult to clean. All my vases have LIFETIME REPAIR, COST-FREE. If any damage should ever occur, I will need the pieces back so that I can reconstruct the vase. All this information will be on the hang-tag on the vase. 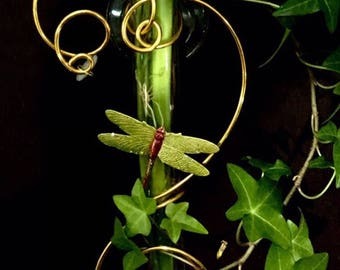 Please be sure to check my shop for other dragonfly, bug, and nature themed suction window vases by VasePlace.